William Thomas McCabe, the son of Joseph and Margaret McCabe was born on January 4, 1922 in Dothan, Alabama. His Father, Joseph McCabe was a chaplain in the Salvation Army so the family of seven moved a lot. The McCabe's finally settled in Carlisle, Pennsylvania where Joseph worked for the railroad company. In 1928 Joseph tragically passed away leaving Margaret to raise the five children during the Great Depression. In 1933 William's younger brother Charles passed away at the age of eight. The Great Depression struck the McCabe family hard. They lived modestly in a small home on Bedford Street in downtown Carlisle. The only source of heat in the house was a cook stove which all the children huddled around while Margaret made breakfast before leaving for school. William was the only person in his family to graduate from high school. The rest of his siblings dropped out of school to work in order to support the family. William graduated with the Carlisle High School Class of 1941. In high school William was in the Vocational Course and President of the Future Mechanics of America Club. According to the 1941 Carlisle High School yearbook, he was a smooth dancer and always busy. The entire McCabe family was very proud of his academic achievements. In his teen years, William took his late father's place as the man in the house, looking after the rest of the family. He worked for several years in Harrisburg, Pennsylvania after high school. William's mother, Margaret remarried and moved from Carlisle to Oklahoma. From Oklahoma William enlisted in the U.S. Army. The small town of Carlisle, Pennsylvania played a rather important role during World War II, being home to several manufacturing companies. Now the U.S. Army War College, in 1920 it became the home to the Medical Field Service School. Established under the command of Colonel Percy M. Ashburn, the school drew upon the lessons of World War I and began its mission to develop medical equipment and doctrine suitable for the battlefield. This would be where the Carlisle Model First-Aid Packet was originally designed to tackle the problem of front line wounds and casualties. The new Carlisle Bandage was also created here to be used in World War II. At the same time, the school used the classroom instruction and frequent field exercises to train the Army in the care and handling of casualties, as well as in the prevention of disease newly commissioned Medical Service officers underwent a rigorous five-month basic course, while National Guard and Reserve officers attended six-week courses. Selected non-commissioned officers from all the components received eight weeks of training. In all, over 30,000 officers and NCOs passed through the school during World War II. Opened in 1917, the Carlisle Tire and Rubber Company focused on the production of rubber tires for military use. Because of the war, 95% of the natural rubber supply from the East Indies was blockaded, the company began to produce synthetic forms of rubber for military use during the war. Frogs, switches, and other railroad components were the original steel parts manufactured by the plant, dating back to 1881. At the time of World War II, the company switched to producing components for tanks and trucks to aide in the war effort. "American and Allied glider pilots did much to help win the war in Europe. Their fragile planes, towed behind C-47s or other powered aircraft, were responsible for putting large numbers of infantry troops on the ground during major assaults. Pulled behind their tow-planes, these pilots often found themselves released early or off-course, often under fire, and had to put down wherever they could find an open space. Landings were dangerous and frequently fatal. American glider pilots, along with airborne forces, spearheaded all the major invasions, landing behind enemy lines in their unarmed gliders in Sicily, Normandy, Southern France, Holland, Bastogne, Rhine Crossing, Luzon in the Philippines, and Burma. One veteran American glider pilot painted a vivid picture of the stark terror they experienced. "Imagine", he said, "flying a motorless, fabric-covered CG-4A glider, violently bouncing and jerking on a 11/16 inch thick nylon rope 350 feet back of the C-47 tow plane. 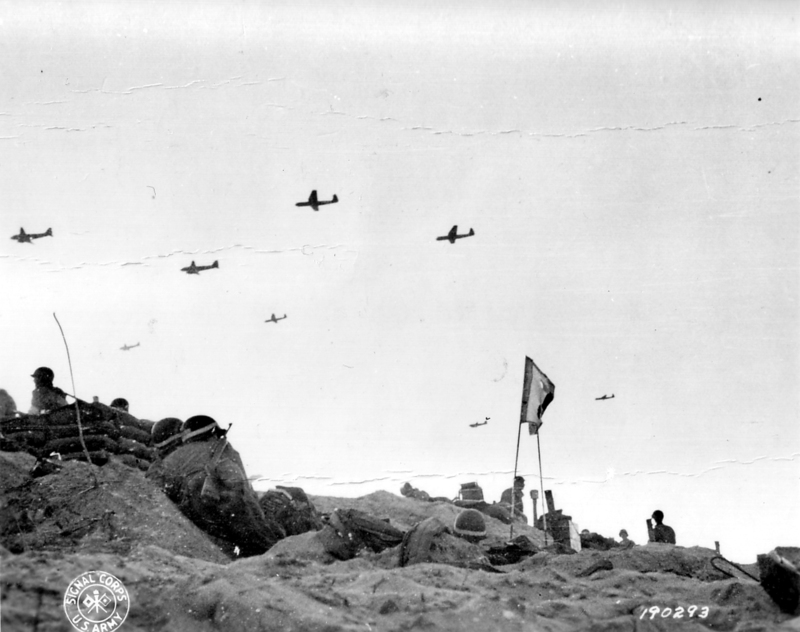 You see the nervous glider infantrymen behind you, some vomiting, many in prayer, as you hedge-hop along at tree-top level instinctively jumping up in your seat every time you hear bullets and flak tearing through the glider. You try not to think about the explosives aboard. It's like flying a stick of dynamite through the gates of Hell." There were only about 6,000 American military glider pilots, all volunteers. They proudly wore the silver wings with the letter "G" superimposed on them. The brash, high-spirited pilots were not a bit bashful about letting everyone know that the "G" stood for "Guts"." The glider mission carried out by the 435th Troop Carrier Group would fly in the 320th Glider Field Artillery Battalion, one of the artillery units of the 82nd Airborne Division. The Group flew 12 Waco CG-4A gliders and 38 Horsa gliders. They were to land at LZ-W (Blosville - Boutteville area) at 11:10 p.m. Most of the gliders landed scattered over a larger area. And the big Horsa gliders were not suited for the small fields in Normandy. High casualties were a result during the D-Day landing of June 6, 1944. Today I have the privilege of honoring Flight Officer William T. McCabe. Mr. McCabe grew up in my hometown of Carlisle, Pennsylvania. When I look at this simple cross among thousands of others, I see his senior picture in my mind, I imagine the terror of being a glider pilot, and I hear his nephew’s voice telling me about the pride of the McCabe family. In 1941 Mr. McCabe graduated from Carlisle High School, the same high school I attend. The McCabe family was very proud of him because he was the only family member to graduate high school. In his yearbook picture he looks very young, with dark curly hair and a bright crooked smile. Mr. McCabe experienced many hardships throughout his childhood. His father and younger brother both passed away leaving his widowed mother to single handedly care for their large family during the Great Depression. 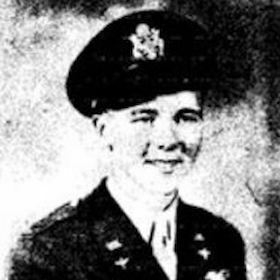 After graduating high school, William enlisted in the Army and bravely volunteered to be a glider pilot, one of the most dangerous jobs in the Army. After completing his training in the United States he was deployed England. One veteran American glider pilot describes the stark terror they experienced. "Imagine", he said, "flying a motorless, fabric-covered CG-4A glider, violently bouncing and jerking on a 11/16 inch thick nylon rope 350 feet back of the C-47 tow plane… It's like flying a stick of dynamite through the gates of Hell." The Carlisle High School class of 1944 dedicated their yearbook to all those who were striving to secure world peace. Mr. McCabe embodied that goal when he heroically perished on June 6, 1944. The most important and special part of my research came from my communications with Martin McCabe, William’s nephew. He asked me to say this on behalf of the McCabe family. “For our Uncle William; your nieces and nephews from your sister Emma McCabe Malloy and brother Joseph McCabe would like to say that even though we did not have the opportunity to know you. We are all very proud of you and your sacrifice.” I too am proud and thankful for William T. McCabe’s sacrifice. In 2012 I had my senior picture taken for the Carlisle high school yearbook - an important rite of passage for all high school students. As I sat in my starched dress shirt, tie, blazer I could not help but think of the bright hopeful smile of William T. McCabe, who 70 years earlier sat for his Carlisle High School senior picture. My assignment from the Normandy Institute was to research and honor one of the 1,213 Pennsylvanians buried in the American Cemetery in Normandy. I decided to honor a soldier from my high school. After combing through old newspapers, I discovered William’s obituary that identified him as a Carlisle graduate. My next stop was the high school library to find the 1941 yearbook. William’s photograph and his smile will remain in my heart forever because, through the Normandy Institute, I learned firsthand the sacrifices of William and the men and women of his generation. Since being a high school senior is all about looking forward, I wondered as I posed for my picture whether anyone would ever look back at my senior photo with the same amount of respect and gratitude that I have for William. While my Normandy Institute experience taught me about sacrifices – more importantly it taught me about privileges. First, I recognized that I have had the privilege of an incredible childhood and I have been influenced by outstanding educators such as Mr. Wagner. William was the pride of his family as he was the only one of 5 children to graduate high school – as his brothers and sister had to leave school to help support their widowed mother. William was a glider pilot and I learned that the pilots would often say that the “G” on their silver wings stood for “GUTS.” As a 21st Century American teen, I have never had to experience the fear or witness the horrors of battle. Yet I have the privilege of living in a country free of the tyranny that William so bravely fought against. 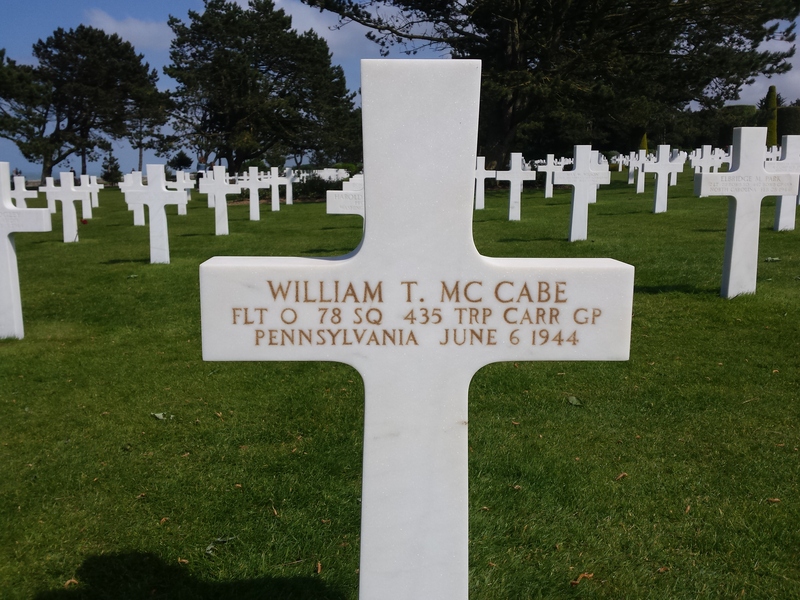 Finally, I had the privilege to honor William at his resting place in Normandy. I was able to kneel in front of the white marble cross that bears William’s name and place American and French flags in the soil. For the McCabe family, the flags I gave them, stained with the soil from William’s grave, brought closure for their family. The Evening Sentinel. “Glider Officer Missing in France.” June 12, 1944. http://www.cumberlink.com. The Evening Sentinel. “Allies Invade France.” June 8, 1944. http://www.cumberlink.com. Pennsylvania. Cumberland County. 1930 U.S. Census. Digital Images. http://ancestry.com. Records for William T. McCabe; World War II Army Enlistment Records, 1938-1946 [Electronic File], Record Group 64; National Archives at College Park, College Park, MD [retrieved from the Access to Archival 2011 at http://aad.archives.gov/aad/series-description.jsp?s=3360&cat=WR26&bc=,sl, March 27, 2011]. William T. McCabe, Individual Deceased Personnel File, Department of the Army. William T. McCabe, Official Military Personnel File, Department of the Army, RG 64, National Archives and Records Administration – St. Louis. “The Arsenal of America: Pennsylvania During the Second World War.” Explore Pennsylvania History. Last updated 2011. Accessed May 1, 2011. http://explorepahistory.com/story.php?storyId=1-9-19&chapter=1. Brennan, T.J. “Tribute to the American Combat Glider Pilots of World War II.” National WWII Glider Pilots Association. Last modified 2011. Accessed March 24, 2011. http://www.pointvista.com/WW2GliderPilots/. McCabe, Martin, Telephone interview with Sam Spare. May 21, 2011. Silent Wings: The American Glider Pilots of World War II. Directed by Robert Child. 2007. New York: Inecom Entertainment Company. 2007. DVD.